Galaxy Nexus Owners Receiving Android 4.1 From Verizon Already? Home Android Galaxy Nexus Owners Receiving Android 4.1 From Verizon Already? 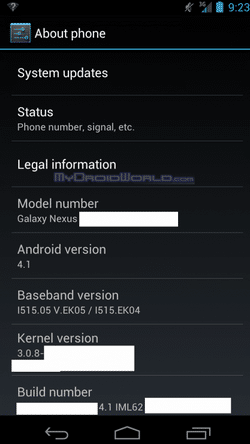 Lucky Verizon Galaxy Nexus owner from mydroidworld forums, bradgog, has posted a post informing that he has received an over-the-air firmware update from Verizon bringing Android update 4.1 on his Verizon Galaxy Nexus. The update, as you can see from the screenshot, includes a new baseband version to make the device more stable, according to Phandroid.com.